No words can describe this recipe. It’s just that good. I’ve shared it a couple of times on various blogs I’ve done, but I must say — this variation is the best. The reason I love this dish is because it’s simple, and fun to make. You can either make it in no time at all, or take the slow route to give it a different flavor and complexity. Pre-heat oven at 250 degrees Fahrenheit. Prep chicken and place on a baking sheet. Squirt with the juice of one lime and brush with soy sauce. Place in oven and let bake for 2 hours. In a small bowl, whisk together brown sugar, lime juice, soy sauce, and Siriacha. Set aside. In a large, nonstick skillet, heat oil over medium-high heat. Add scallion whites and garlic. Cook, stirring constantly, until fragrant (about 30 or so seconds). Turn down heat to low-medium. Add eggs. Cook by folding them over almost constantly with a rubber spatula. Cook until almost set. Transfer eggs to a plate. Bring a pot of salted water to a rolling boil. Add noodles. Be sure to stir constantly for the first 3-5 minutes. After about 10 minutes, check your pasta. Drain when cooked thoroughly. Take chicken out of over and let stand. Slice into bite sized pieces. Add noodles, scallion greens, and sauce to skillet. (Feel free to grab your wok if you have it.) Cook, tossing constantly. Add egg mixture, and chicken. Toss to coat, breaking eggs up gently. 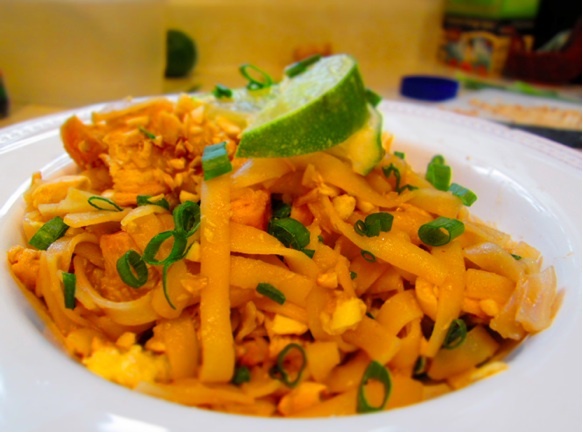 Serve noodles with lime wedges, topped with peanuts and scallions. Looks so good! 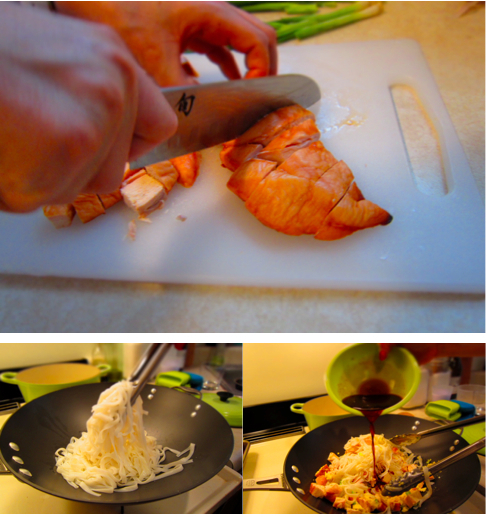 I love making Asian inspired dishes…I will definitely try this recipe. Cheers! I will def be trying out this recipe! Looks yummy!! You making my favorite dish. I .. need .. to .. cook .. one .. of .. these .. days! Have you eat at King & I on S. Grand. Theirs the best.